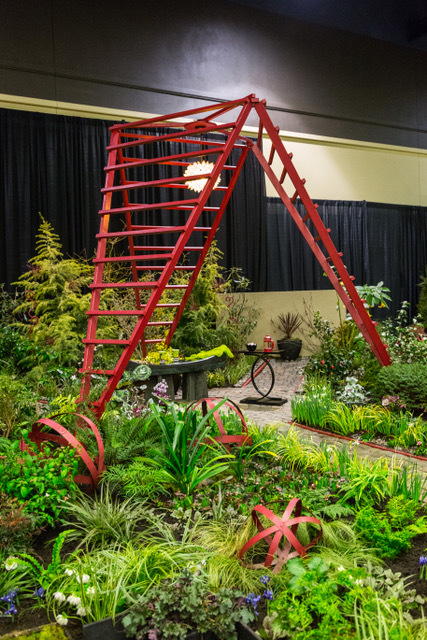 Just when we need it the most, it’s here: A breath of spring delivered right along with the 2018 Northwest Flower and Garden Festival. Garden Party, this year’s theme is a challenge to talented designers to come up with one-of-a-kind party venues. There’s everything from a Child’s Birthday Party, to Picnics, backyard Barbeques, Patio Parties and a Rustic Bar featuring beverages for grownups. rite and easiest ideas to adapt from this year’s show are featured below. Flower Growers of Puget Sound, with their “Cavalcade of Color,” has put together an amazing array of locally grown plants including flowering perennials, spring bulbs and shrubs. 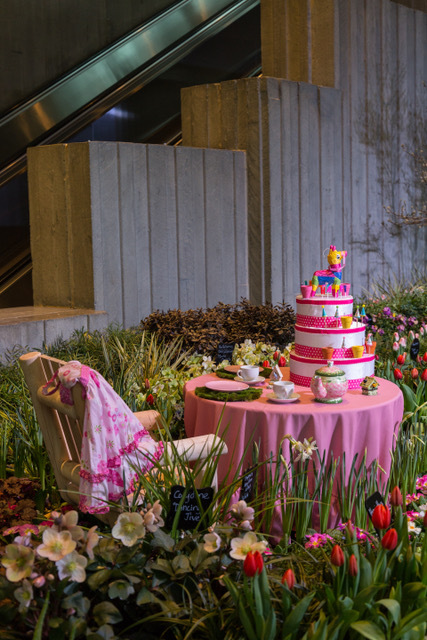 In the midst of it all is a charming table topped with a pink table cloth, party china and a multilayered cake that compliments the surrounding flower garden perfectly. Take Away: Always consider adding a colorful cloth, runner or center piece of natural materials to your outdoor table to emphasize your chosen color scheme or theme. This is typically inexpensive, can be dramatic, and may add just the right touch of additional color to your special garden party! Fancy Fronds and ALBE Rustics “Celebrate Form: Art Imitates Nature.” Natural foliage and man-made shapes echo forms found in nature. The use of repurposed materials such as plant stands made of stainless steel bowls and sewer pipe and orbs made from painted wine barrel rings tied together, punctuate this design. A large geometric obelisk in red towers over the garden. Take Away: All garden color doesn’t have to come from plants. Add color to the garden with painted recycled art you create! You’d be amazed what you can do to brighten the garden with a $5 can of spray paint. Redwood Builders, Landscaping “Pot Party.” The designers skillfully highlight a Zen-inspired garden complete with bonsai trees in a variety of pots displayed on pedestals around a modern pergola and pond. Take Away: Plants displayed in pots can add color, texture and special interest to the garden. Potted Plants can be successfully integrated into the planting beds where they will add drama and color year round. Container Plants don’t need to be pricey bonsai plants just something with an interesting structure that you like, that can live in a container for a few years. Move them to the garden when they outgrow their containers or pass them on to a gardening friend or if you are of a mind, try bonsaiing it! Elandan Gardens created “Living Art-fully! 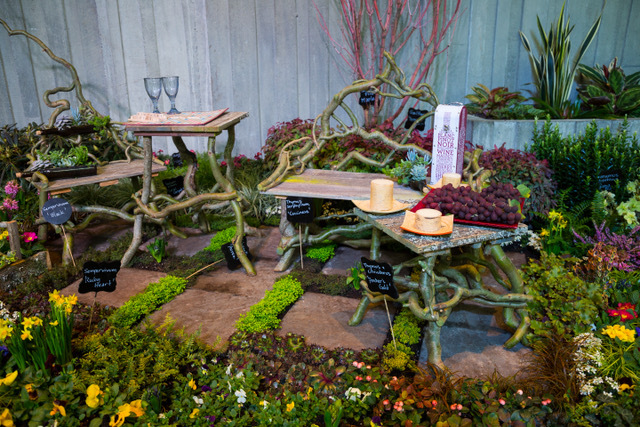 It’s in our Nature.” A large Cedar Root and nurse log are the unlikely stars of this vignette. Peace and Harmony can be felt among large stones, a 98 year old Japanese Black Pine, a Waterfall and reflecting Pond. 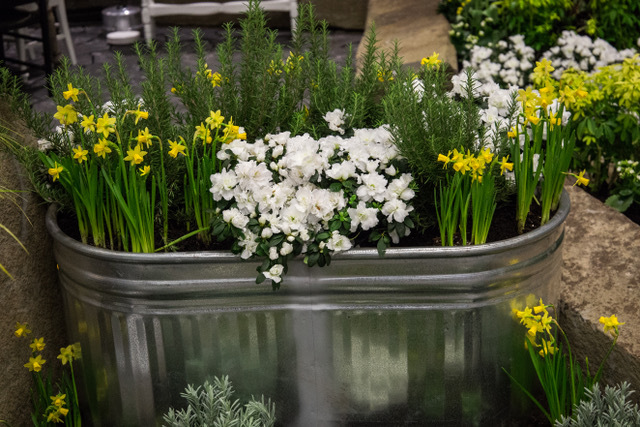 Take Away: Watch for natural elements to incorporate in your garden or in containers. Pruned branches, fallen limbs, uprooted trees and shrubs, abandoned stone all have the potential for becoming important elements or even garden art in your garden. Neighbors and friends often have extra natural material, for which they have no use. It might serve as a great addition to your garden. West Seattle Nursery and Devonshire Landscaping work with “Wabi-Sabi, Embrace Flawed Beauty,” as it recognizes three realities: nothing lasts, nothing is finished, and nothing is perfect. A serene spa-like setting in a muted color palette acknowledges we are all beautiful in our own way. Take Away: Subtle can be beautiful. Soft colors and a gentle presentation are very inviting. Great Plant Picks is sponsored by the Elisabeth C. Miller Botanical Garden. It provides online information on over 900 plants selected for gardeners living west of the Cascade Mountains. Take Away: Check out plants you are considering for your garden with this wonderful resource, ‘Great Plant Picks’ online.